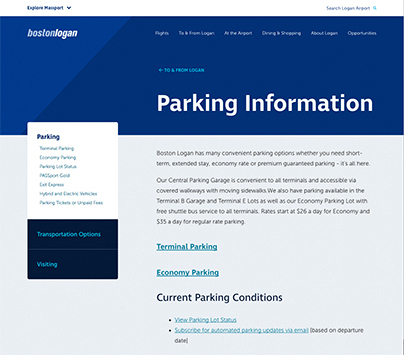 A focused, accessible redesign of Massport.com, the online home of Boston's leading transportation hub which encompasses Logan Airport, regional airports, and the Port of Boston. This mobile-optimized website provides an efficient resource for travelers in a hurry, solidifying Massachusetts as a forward-thinking transportation and tourism authority. 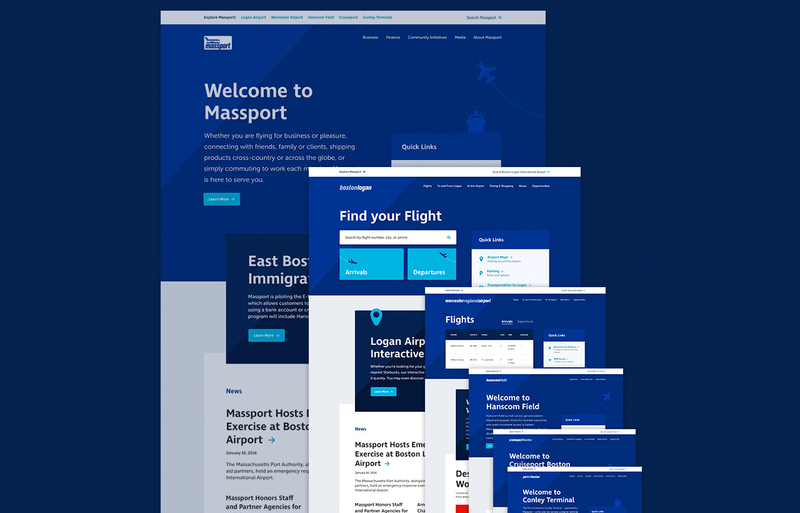 A modern redesign of Massport.com, Boston's leading transportation hub which encompasses Logan Airport, regional airports, and the Port of Boston. The mobile responsive website provides organized online services for travelers and passengers and establishes Massachussetts as a transportation and tourism authority. Massport needed a reliable, multifunctional website to provide quick and user-friendly access to their services. The old website did not take into consideration Massport's diverse audience and the design wasn't reflective of their brand identity. Massport needed a reliable, multifunctional website to provide quick and user-friendly access to their services. The old website did not take into conosideration Massport's diverse audience and the design wasn't reflective of their brand identity. We conducted user research and usability testing to inform an iterative, mobile-first design process. 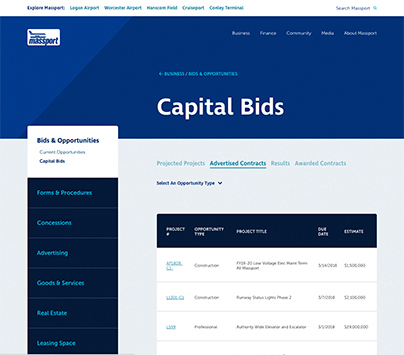 Strategic content organization ensures that Massport.com now offers the right kind of information in the right places, and the site is responsive and fully accessible. We conducted user research and usability testing to inform the design process. 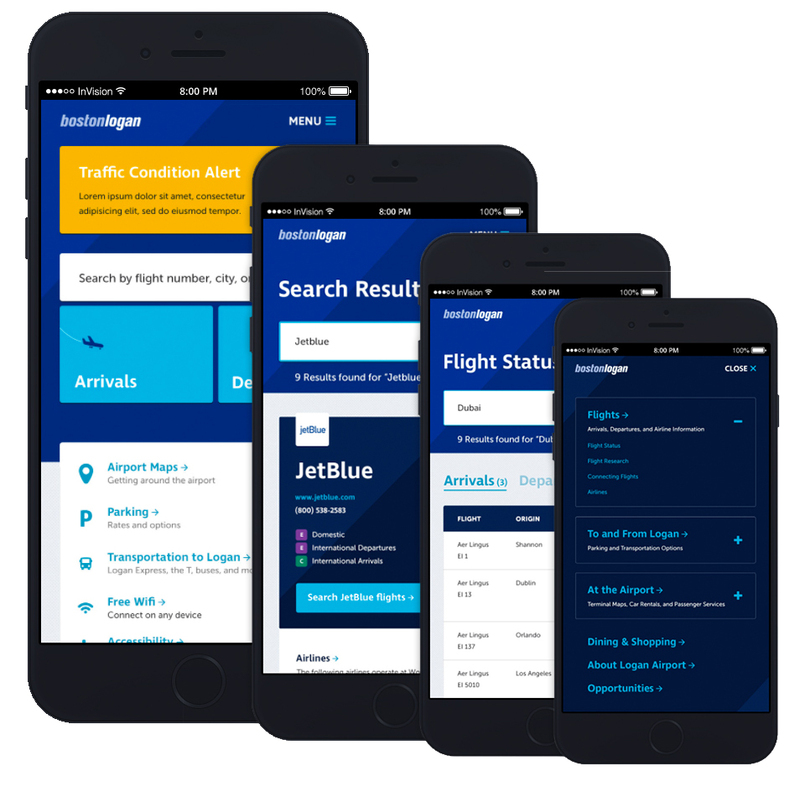 Strategic content organization ensures that Massport.com now offers the right kind of information in the right places, and the site is mobile responsive and full accessible. An important part of the discovery process was researching the Massport target audience. As well as travelers and prospective passengers, the website is visited by vendors, businesses, and investors. We carried out competitive analysis and user research to define their audiences, learn about their content needs, and establish a hierarchy of that content. We scripted and carried out usability testing with a diverse set of users on mobile and desktop, applying and testing user-centered design principles. We tested their ability to execute specific actions as well as broader explorations of the site which gave us critical information about how intuitive the site was to use and navigate. We video taped their interactions for further review with the client and the entire team. We scripted and carried out usability testing among the website's main users, and applied and tested user-centered design principles which aided us in evaluating how intuitive the site was to use and navigate. Though we were not tasked with rethinking the core Massport brand, we enhanced and augmented it to better suit the needs of a modern website with such a diverse audience. With an expanded color palette, and inspired by the type- and icon-focused wayfinding in an airport, we crafted a digital experience focused on easy-to-scan content in a clean, refined, interface. This was also informed by the decision, early on, to remove nearly all photographic elements, to allow the user to focus on finding specific information as quickly as possible, with few distractions. Our design process started with an exploration of brand characteristics. We then applied the final branding to the website design and provided standards guidelines to the client. We followed a mobile-first, responsive design approach based on an in-depth analytics review, while carefully considering how every design decision affected all screen sizes, from mobile to desktop. The user and use-case considerations here were very involved: we even considered whether users on desktop were more or less interested in Arrivals vs. Departures, compared to mobile users (turns out, they were not). We followed a mobile-first, responsive design approach based on an in-depth analytics review, while carefully considering how every design decision affected all screen sizes, from mobile to desktop. The site integrates with over 17 distributed systems and third-party applications, including a flight tracker, parking and weather information, and a Capital Programs Opportunities Database. We established the method of integration early in the process and set up proofs of concepts, before designing how the data would be presented seamlessly on the new site. The site integrates with over 17 distributed systems and third-party applications, including a flight tracker, parking and weather information, and a Captial Programs Opportunites Database. We established the method of integration early in the process and set up proofs of concepts, before designing how the data would be presented seamlessly on the new site. The Massport site has been designed and tested for WCAG 2.0 AA, ADA and Section 508 compliance. This means users who are visually impaired or who navigate the web with screen readers are ensured a consistent and good experience through out the website. The Massport site has been designed and tested for WCAG 2.0 AA, ADA and Section 508 compliance. This means users who are visually impared or who navigate the web with screen readers are ensured a consistent and good experience through out the website. Massport's history, background, and core values are now an integral part of their online experience and brand identity, enabling them to share their story on a global scale and providing their 4.6 million annual website users with an accessible and organized interface to find the information they need, easily and quickly. Massport has chosen Blenderbox as their agency of record. We continue to work with them on maintenance, security, and enhancement projects.